Monty smiling at us on his walk! Monty is the best dog in the world to me! I love him so much! When we went to the Isle of Wight one year (it is our favourite place to go ever!) we saw an Aussie pup called Diesel (Monty's half brother) and we asked what breed he was and where they had got him from, they said right there on the island! So I researched and found the breeder and we looked into the breed. It was like an omen as like I said, the island is our favourite place to go, was very near us (just a short ferry trip away) and we took one look at the breed and fell in love. Went to visit the breeder and they were so nice! They have three Aussies who are kept in the house with a cat and the breeder's daughter! The three Aussies were Kane, a German champion and Crufts competer, Mausie, Kane's sister, and Ticket, with a few accomplishments under her belt, too!! Kane and Ticket were bred together to produce Monty's litter. Monty had an almost completely white head!! 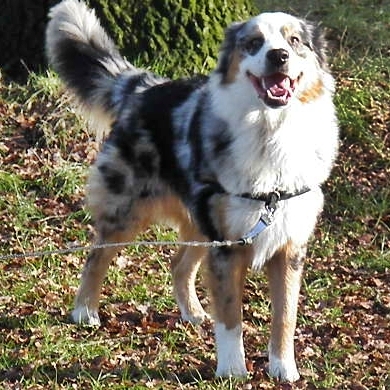 I fell in love with him straight away, but the rest of my family liked another blue merle, Freckles, who had lots of 'freckle like' markings on his face! He was smaller than Monty as well. We went to visit the pups when they were 8 weeks old, a week before we were collecting him, and Freckles just didn't seem right for us. We just didn't click with him. We changed our minds and decided on Monty, apologising to the breeder of course!! Luckily no one had picked Monty and as soon as we deserted Freckles, he was snapped straight up by a rich couple who live in a mansion! So I think he's quite happy!!! haha. It was the best decision we ever made, choosing him instead. He is the perfect dog for us -- SO friendly and welcoming to everyone he meets, including all dogs! I think he is a fantastic companion for us. He is entered into Crufts this year (March 2010) so I hope he will do well!! !